We have had many enquiries about whether Curating Lab will be making a comeback and the answer is yes! Curating Lab 2014 offers final year tertiary students, recent graduates and young curators exposure into contemporary curatorial perspectives and practices. 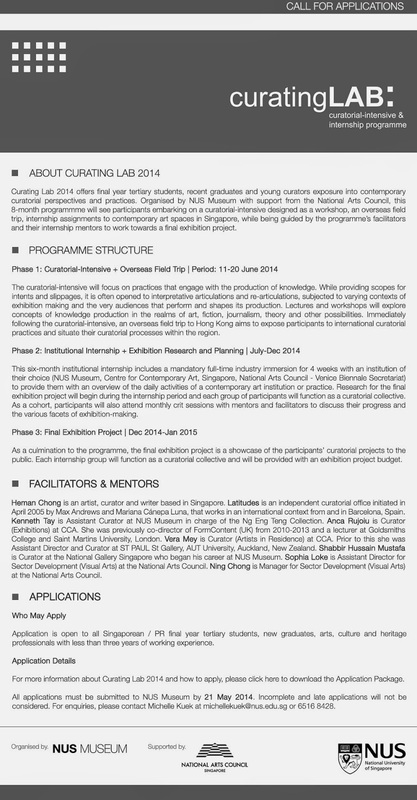 Organised by NUS Museum with support from the National Arts Council, this 8-month programmme will see participants embarking on a curatorial-intensive designed as a workshop, an overseas field trip, internship assignments to contemporary art spaces in Singapore, while being guided by the programme’s facilitators and their internship mentors to work towards a final exhibition project. To download the Application Package for more information and how to apply, please click here.